One of my all time favorite restaurants is part of a chain — a really good chain and one that has been around for decades. It is part of the Lettuce Entertain You chain of themed restaurants in the States and hails from none other than my kinda town, Chicago. I remember the first time I lunched at Maggiano’s Little Italy back in 1995 and had this amazing salad. It was a hot and beautiful July day, as days in July in Chi usually are. I rode my bike from work, as I did way back then in 1995, to Navy Pier and parked it on the deck of the USS Samuel Eliot Morison, a US battleship. My cousin, Tommy Daniel happened to be the commander of this massive ship. The ship docked in Chicago as part of a recruitment effort. He invited a group of family and friends to tour the ship. Most of what I remember was all those sailors and how cramped the ship was below deck. Afterwards we went to Maggiano’s on Clark Street for lunch. My mom suggested the family sized chopped salad as a starter. It was packed with sweet, sour, hot, crunchy, smooth, bitter and silky on one plate. I have been imitating this salad since. The nice thing is, after I had the salad, I called Maggiano’s ready to beg for the recipe. They enthusiastically gave them the ingredients. I hop you like it!!! 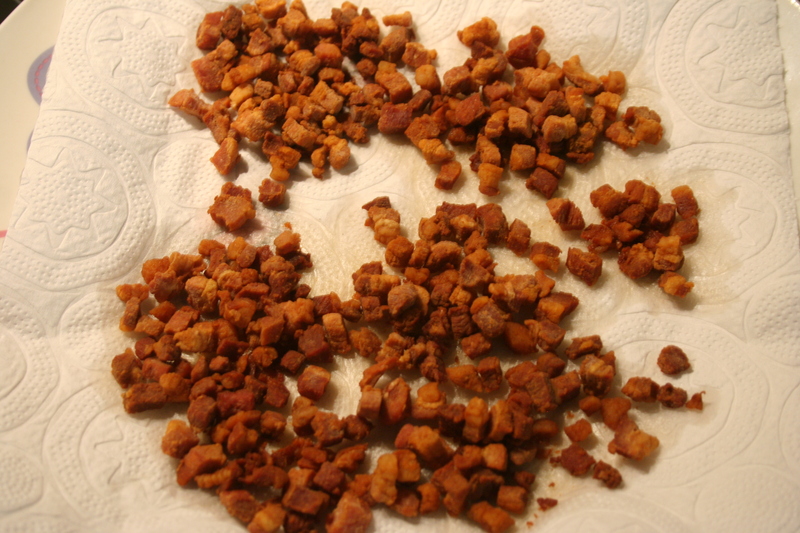 Fry diced pancetta until it is crispy. 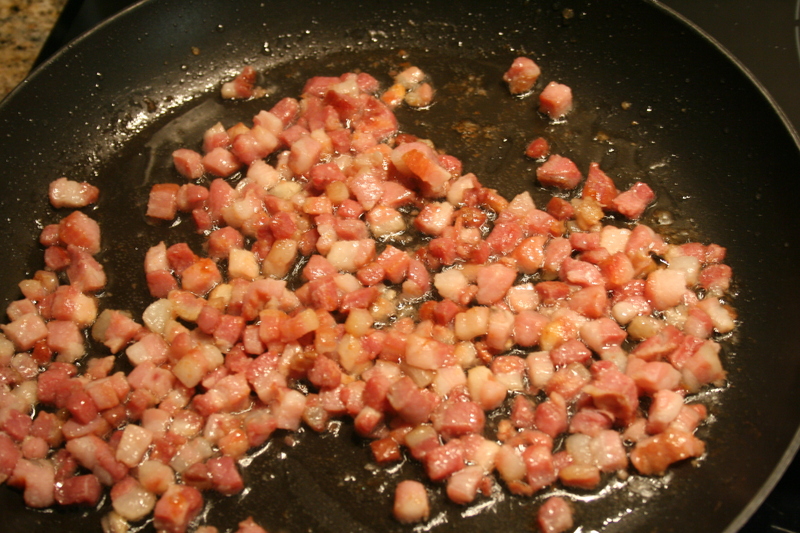 If you don’t have pancetta, you can use the bacon of your choice or prosciutto. If you don’t care for pork, you can add chopped chicken. Watch it carefully and take care not to burn it. 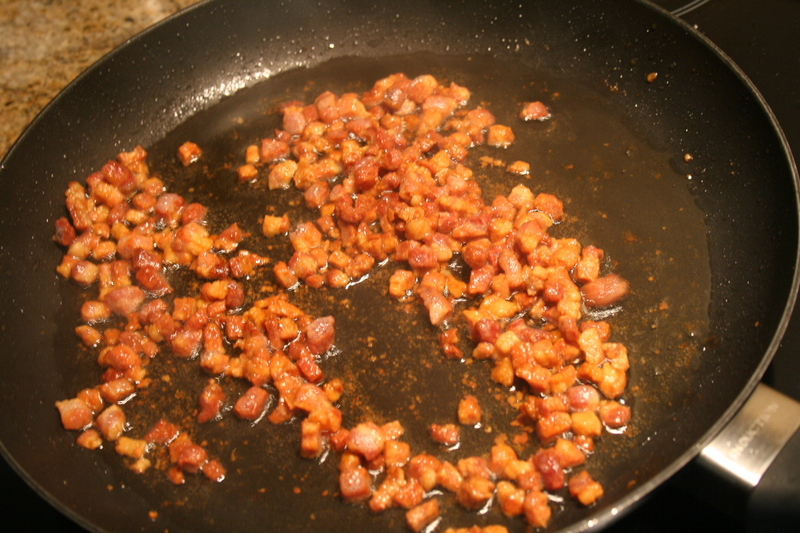 Place pancetta atop a paper towel on a plate and set aside. Before you start the salad dressing, you want to have something to put it in ready. 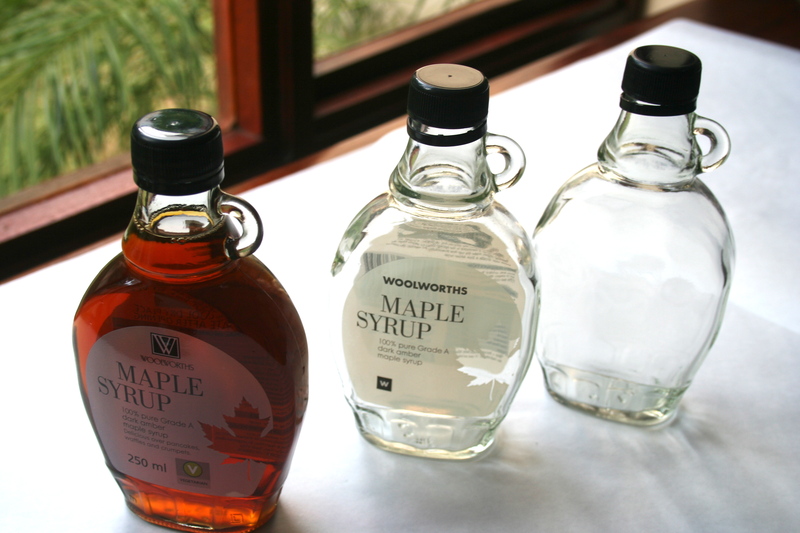 I save syrup bottles, which are perfect for salad dressings and other homemade delights. Add water and vinegar to blender bowl. Add sugar, mustard, peppers, oregano, garlic, salt and garlic. Give it a quick whirl. Combine the olive oil and the vegetable oil. 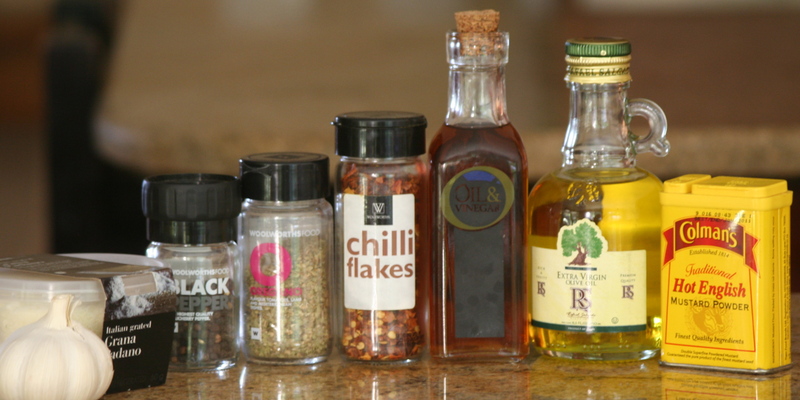 While the blender is going, slowly drizzle the oil into the blender and blend for 3 to 4 minutes. 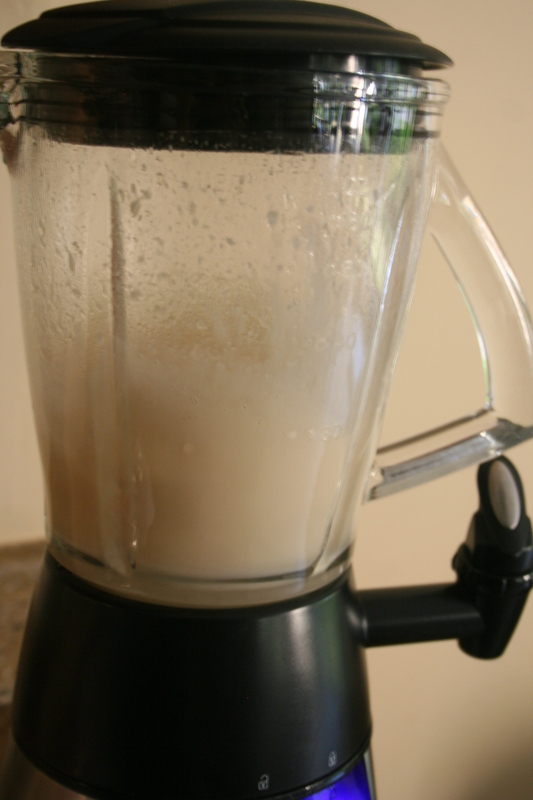 This creates the emulsion which will make the dressing appear creamy and slow down separation. The oil will start rising to the top after a few hours if you blend in the Parmesan. I will explain that in the next step. Now for the Parmesan. You have a choice. If you would like a very smooth dressing, add the Parmesan and pulse with other ingredients. If you would like more texture, just add the Parm to the blender bowl and simply mix it with a spoon, though with the Parmesan stirred in, the dressing seems to separate faster. 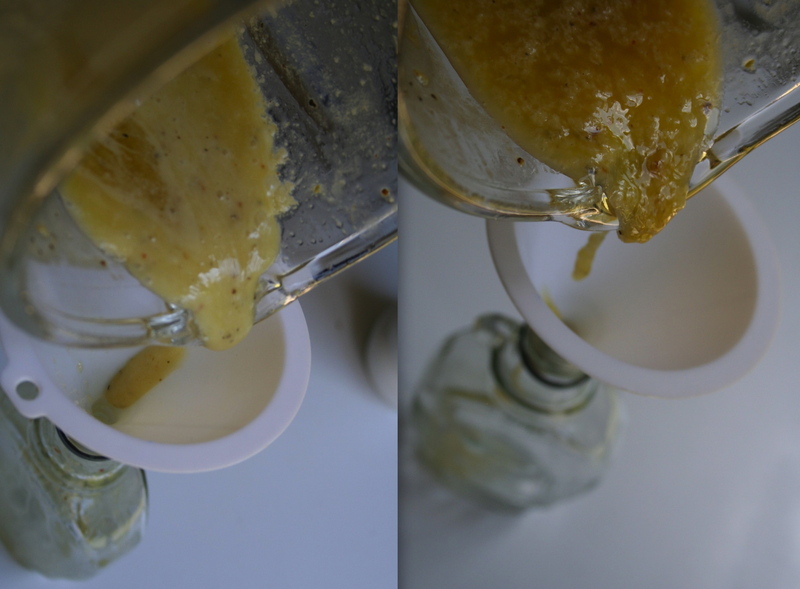 Image on the left shows the smoother version with the Parmesan pulsed into the dressing. The second image shows a grainier texture with just having stirred in the Parmesan. I halved the recipe and it made about 125 mls (1/2 cup) of salad dressing. This is a 250 ml bottle. Arrange chopped crisp (iceberg) lettuce on a platter then top with chopped romaine and chopped tomatoes. Around the edge of the platter, sprinkle chopped avo, then sprinkle chopped blue cheese and chopped pancetta. 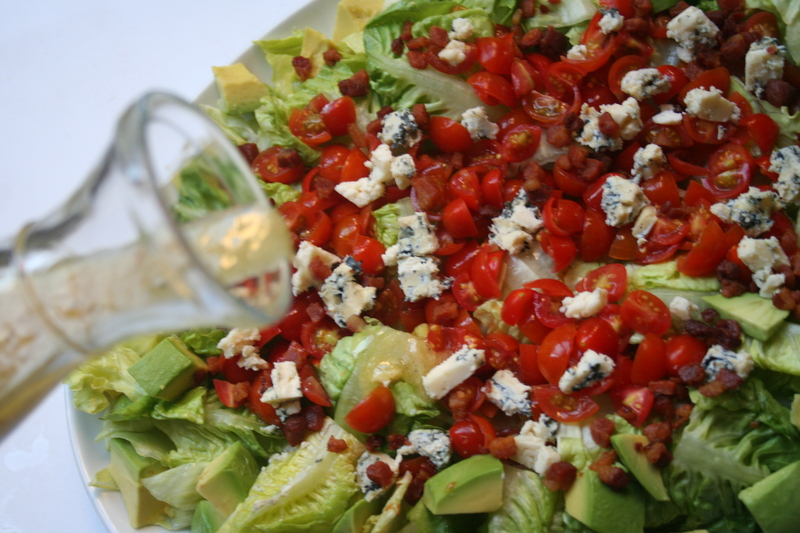 Arrange chopped crisp (iceberg) lettuce on a platter then top with chopped romaine and top with diced tomatoes. 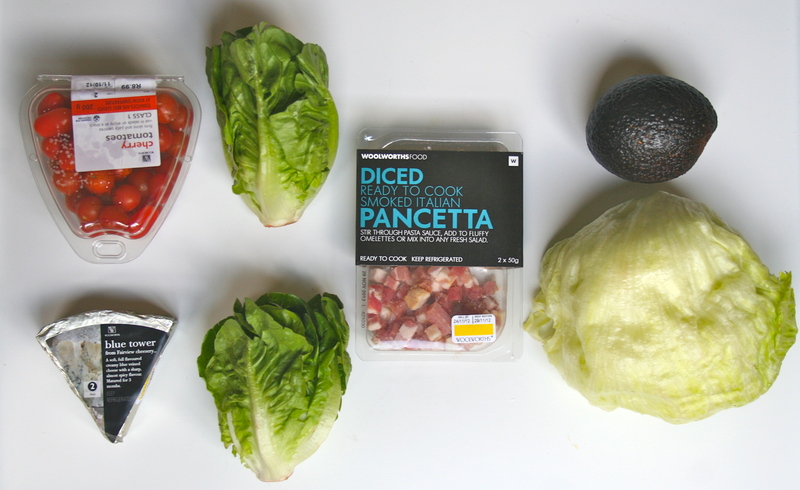 Around the edge of the platter, sprinkle diced avo, then sprinkle crumbled blue cheese and chopped pancetta. 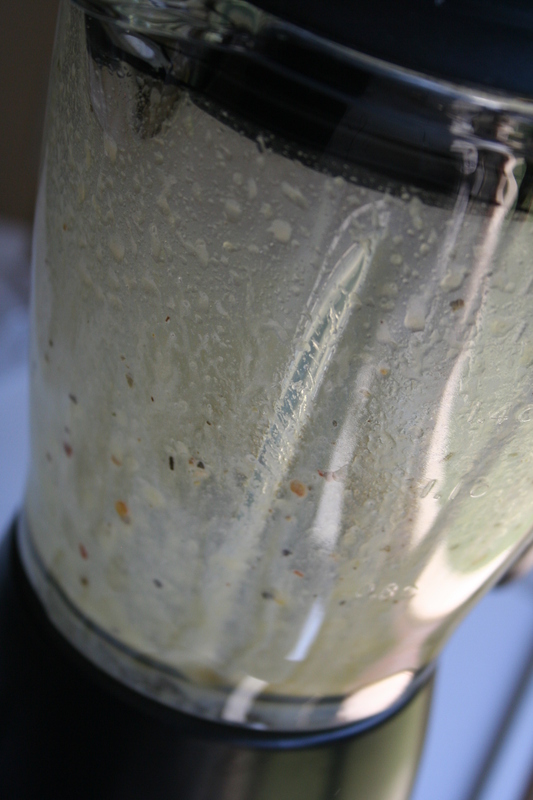 Pour water and vinegar into a blender bowl or food processor. 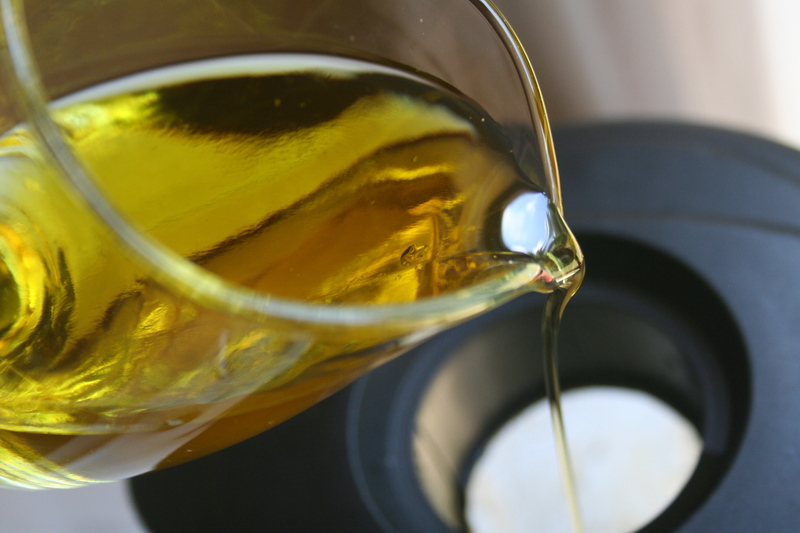 Combine the olive oil and the vegetable oil. 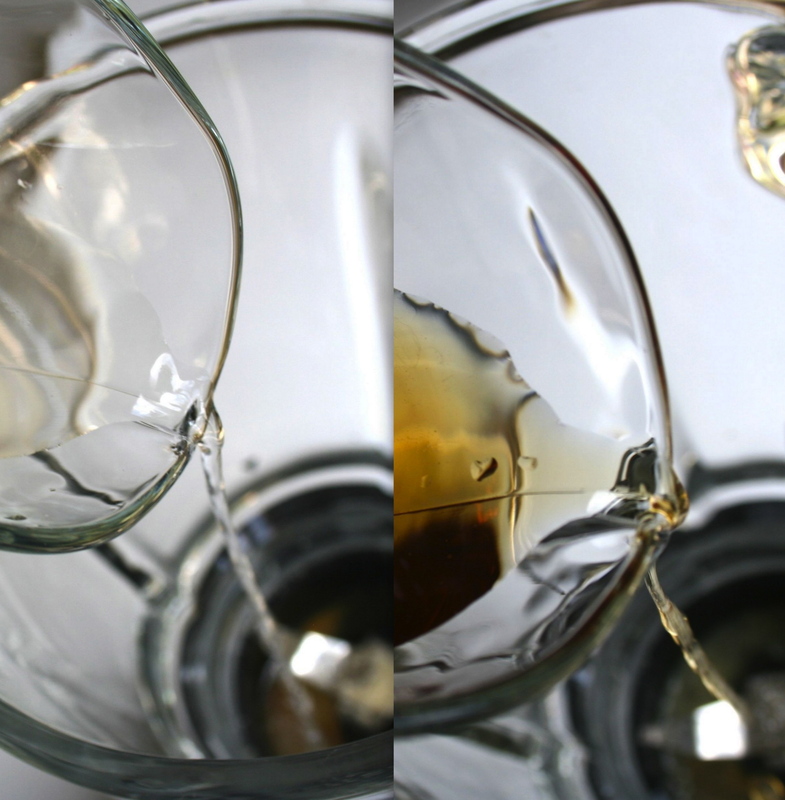 While the blender is running, slowly drizzle oil into blender and blend for 3 to 4 minutes. 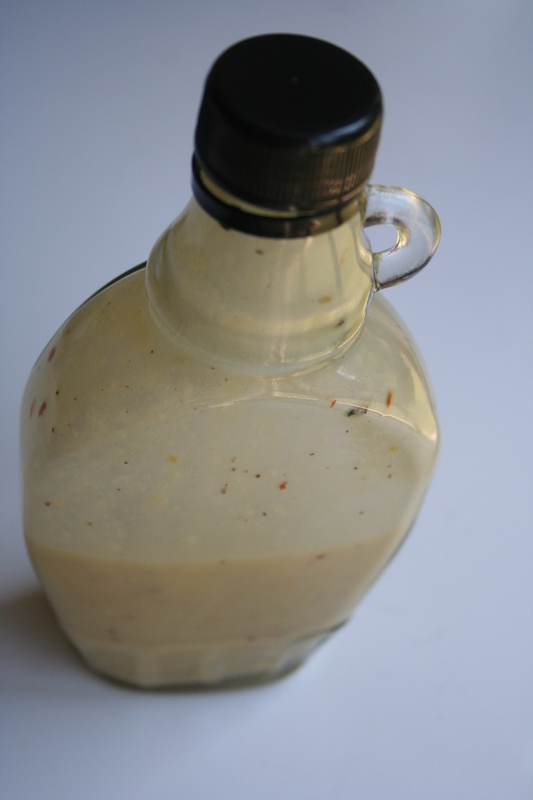 This creates the emulsion, which will make the dressing appear creamy and slow down separation. Now for the Parmesan. You have a choice. If you would like a very smooth dressing, add the Parmesan and pulse with other ingredients. 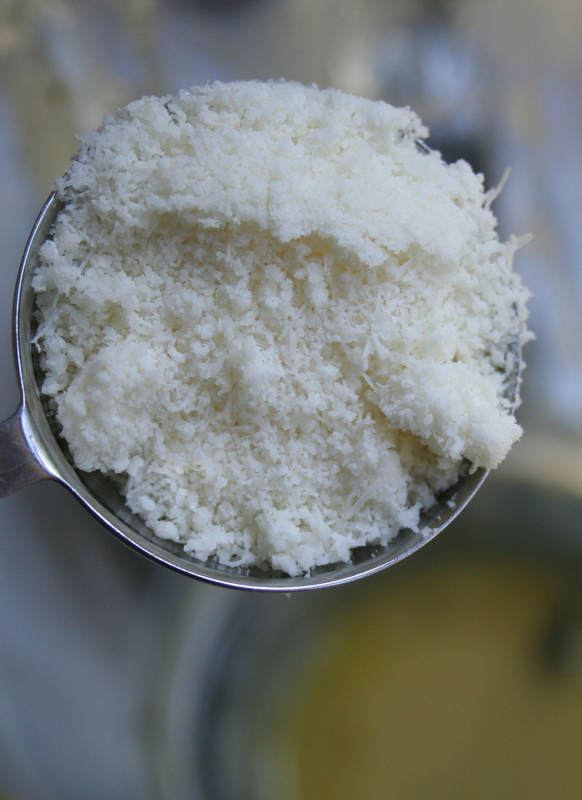 If you would like more texture, just add the Parm to the blender bowl and simply mix it in with a spoon, though with the Parmesan stirred in, the dressing seems to separate faster. 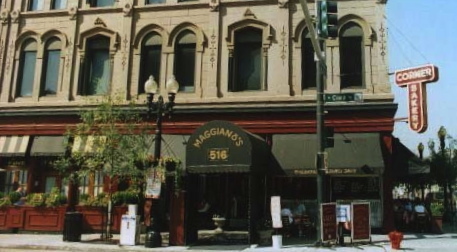 Photo Credit: Photo of Maggiano’s facade was taken from Planet99. Thank you so much for posting this recipe. I made this last night and it was seriously the perfect replica of the salad at Maggiano’s that I swear I am ALWAYS craving. Also I hope that you don’t mind but I shared the link to this recipe from my blog (http://bit.ly/1dIn5eG) to yours for the recipe! Thank you for sharing the link!!! I appreciate that!!! I love Maggiano’s. I actually got married at Maggiano’s in Chicago. I went to Maggiano’s in ATL this summer while visiting the States. They had this thing where if you ordered a pasta dish, you got a free take away pasta also. Not sure if they are still doing it, but that was pretty cool!!! They are!! We were at the Nashville location this past weekend, and they do the take home dish for their classic entrees! Yummmmm. Sooo glad to have found this! I had a couple bites of my husband’s chopped salad a week or so ago and have been craving it ever since!! Yes, they are still doing the take-away on the classic pasts dishes when you buy one. This includes the gluten-free pasta as well! Thanks Rebecca!! I love this salad. I actually asked them for the ingredients for the salad dressing and they gave them to me. I love Maggianos. You can also buy it bottled, but it is not quite as good as fresh. I think I mentioned this before, I actually got married at the one in Chicago.Which one do you frequent?